A screenshot of Boston Mayor Martin J. Walsh’s campaign website following his re-election in 2017. Following this statement, it seemed Boston’s newly-elected mayor meant business. The next year, 2015, the chart below shows he boldly embraced data proving public health interventions are very effective at preventing gang-related homicides (which between 2007 and 2014 comprised 66% of all homicides) and he swiftly increased the number of violence intervention workers on payroll by 60%, from 35 to 56 (payroll titles include: “Sr Streetworker” “Streetworker” “Sr Violence Interrupter” and “Violence Interrupter”). It also suggests he embraced National Institute of Justice data showing that aggressive gang suppression tactics — mass police raids, sweeps, and prosecutions, etc. — are not effective, because he reduced the number of police employees on payroll from 3,178 to 3,034. A graph of 2015 payroll and homicide data reveals an increase in violence intervention workers yielded a decrease in homicides. As the above graph shows, homicides between 2014 and 2015 dipped from 52 to 39, a 15-year low (the number originally reported was 40, but per BPD one homicide was ruled justified). So what happened? Why, since 2015, when the mayor appeared to make all of the right moves per the data, did homicides rise in 2016, again in 2017, and once again in 2018, when as of Monday eight people had been killed in 10 days, pushing homicides up around 10% over the same period in 2017? A graph of 2016 payroll and homicide data reveals a decrease in violence intervention workers yielded an increase in homicides. As shown in the above graphic, after a one-year dip in 2015, homicides quickly spiked 26% in 2016, from 39 to 49. A review of city payroll and BPD homicide data that year reveals that after increasing the number of employees responsible for mediating gun violence in 2015, the mayor immediately cut back 11% on those positions in 2016, from 56 to 50. At the same time, the city increased the number of police employees on payroll by 80, from 3,034 to 3,114. With an average BPD employee salary of $124,787 that year, this increase cost the city roughly $10,000,000.00 in future salary commitments, diverting any leftover funds the city might have used to retain or hire violence intervention workers. A graph of 2017 payroll and homicide data reveals a decrease in violence intervention workers yielded an increase in homicides. In 2017, per the graph above, homicides increased again, from 49 to 57, representing a 16% increase over the year prior. As in 2016, the city reduced the number of violence intervention positions on its payroll 10% further, from 50 to 45. The city, as it did in 2016, also added more police employees to the payroll, 36 of them, which at an average salary of $124,254 that year, cost the city $4,348,890 in future salary commitments (in contrast, the average 2017 violence intervention salary was $41,073). Despite the fact that homicides had cumulatively risen 46% between 2015 and 2017, the mayor once again doubled down on the same strategy in 2018, and in his proposed budget for 2019. Though the 2018 payroll is not out yet, in a widely promoted press release, the mayor vowed $14m more in new police funding and 50 additional police officers. In the same document, he also pledged $1.6m for the city’s streetworker program, which represents a $300,000 pay cut over 2017 salary levels (the total amount of 2017 salaries paid to all of the city’s violence intervention workers was $1.9m). A graphic from a Harvard report called “Losing Faith” examining why a successful gun violence intervention program was eliminated shows that the elimination of the program yielded a sharp increase in both youth and gang-related homicides. During the September primary elections, then-Congressional candidate Ayanna Pressley said, “The people closest to the pain should be closest to the power.” Many people dismissed what she said as “identity politics,” but the above chart shows why what she said matters so much: the same thing happening in Boston in 2018 already happened once before in Boston, in the 2000s. After reaching record homicide lows on account of a successful violence intervention program, it was discontinued in January 2000 in favor of more police operations. 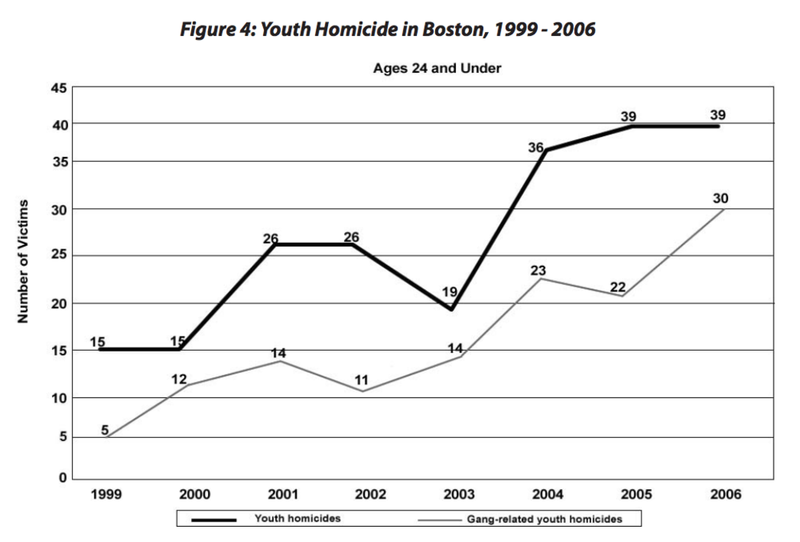 Gang-related youth homicides quickly tripled, and by 2006, sextupled. Yet here the City of Boston finds itself once again, in 2018, after teen gun homicides doubled in 2017, with another clueless white mayor insisting that hiring more police is the way to prevent violence despite two decades of criminological data showing him it doesn’t work. I wrote recently that part of being progressive is knowing when to get out of the way of qualified candidates of color, not because of the color of their skin, but because the people who grow up in neighborhoods affected by gun violence are more likely to understand the above graphic out of Chicago. It shows that, as in Boston, every time violence intervention worker staff numbers are reduced, violence increases. Every time their staffing numbers increase, violence goes down. Yet, despite this data, as in Boston, Chicago keeps cutting its staffing causing violence to increase. What this shows is that communities of color are suffering a catastrophic loss of life while clueless big city mayors like Rahm Emmanuel and Marty Walsh blunder their way through ineffective public safety strategies that run counter to decades of data showing them exactly what to do if they truly want to reduce violence. For $14m — the amount Marty Walsh has vowed to increase BPD funding in 2019 — the City of Boston could hire and train 340 violence intervention workers and virtually eliminate gun violence overnight. But Marty Walsh is too stubborn, or too unaware of what the data says, to do it. Rahm Emmanuel had the sense to step down and get out of the way so that (hopefully) a qualified candidate of color could take the lead and put a stop to this unconscionable, unnecessary loss of human life. It’s time for Marty Walsh to follow suit. He had an entire term to reduce gun violence and he has failed spectacularly. Come 2021, Boston, he needs to be gone.